Joy Mangano My Little Garment Steamer Review (2019)- Is it the Best? 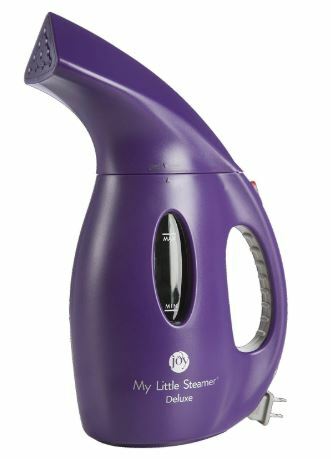 Joy Mangano My Little Steamer Reviews – Your Very Best Friend? 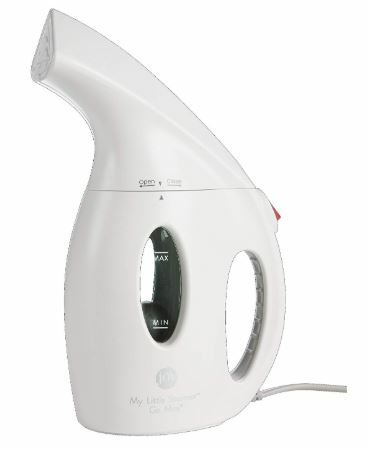 This Joy Mangano My Little Garment Steamer can be the fabric steamer that is right for you. The 30min continuous steam, tank size, auto shutoff feature, low power draw, and lightweight (just 2 lbs) are the features that you may be looking for in a clothes steamer. Everybody could use a garment steamer every now and then. They’re just such handy little gadgets when you’re on the go.But with so many on the market competing for your attention, it’s hard to tell which ones are worth your time for even a second glance. 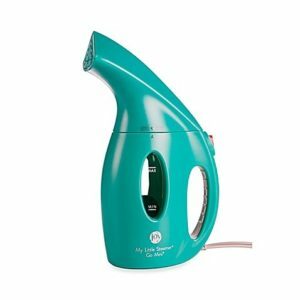 Is Joy Mangano My Little Steamer worth it? Or should you give it a hard pass? In terms of price, Joy Mangano My Little Steamer is actually pretty good. It sits at the lower end for handheld garment steamers, and shouldn’t run you a lot. There’s a certain elegance in its simplicity for the price: the longer snout gives you more reach and makes it harder to burn yourself with dribbles, and the handle is relatively ergonomic. It’s not fancy, but it comes in a variety of nice colors. Overall you can do a lot worse for the price, though it should be said you can also do a lot better with certain higher priced models. The first thing that jumps out about the Joy Mangano My Little Steamer: the size. Compared to other handheld steamers it has quite a large tank (11 ounces; about a cup and a half). This tank size naturally increases its operating time, giving it roughly 30 minutes of continuous steam for you to work with: plenty enough for garments and curtains. It uses plain tap water, which is quite nice as a feature. Many garment steamers require the use of distilled water which can be a bit of a hassle to pour and annoying if you run out, but the Joy Mangano My Little Steamer can just be filled up at any standard faucet (though its large size may make it quite cramped in smaller sinks). The auto shutoff feature makes it safer and easier to use. Irons and steamers are easy to forget they’re running, and steamers can sometimes be ruined by their own heat when the tank is dry. Any feature that hedges against our own tendency to make mistakes is a GREAT one to have. The one other thing that particularly stands out is its power: it draws only 900 watts of power, making it useful on the go in places that can’t handle large power draws (like an RV). Other handheld steamers can draw upwards of 1200 watts (or even 1600). 11 ounce tank for increased usage time. The design makes it quite easy to hold and use. Many reviews point to it dribbling and burning the user, but I attribute that to user error not an issue with the design. You can choose the My Little Steamer Go Mini if for travel and portability. If you hold it properly upright (not tilted weirdly) to use on hanged clothes (remember, a steamer is not the same as an iron and should not be used the same), getting burned should not happen. It weighs close to 3 lbs full, which can strain the wrist over long periods of use, but for the operating time of one tank (about a half hour) there are no issues; it only becomes a problem if you plan to repeatedly refill it for some large project which I do not consider a downside. As a handheld steamer this is not made to handle the same scale as an upright full size steamer (which may have gallon sized tanks and operate for hours on a single fill). All in all this Joy Mangano steamer is easy to use, seems reliable from the time I’ve spent with it, and does the job well enough, though its low power makes its steam still come out “wet”, unlike higher powered models that can produce superheated dry steam. Expect your clothes to come out a little damp when you’re finished, and account for that if you’re in a rush. As mentioned above, the cost is fair considering its competition in the same price range. The price varies depending on retailer and shares similar specifications to other garment steamers in that same range, outperforming quite a few but falling behind some in one aspect or another. I have no complaints about the price in this case. Joy My little Steamer makes a perfect steamer for anyone that needs a solid “wet steam” steamer for use around the house. I don’t recommend it as a travel steamer (it’s a little too large for that) or for steaming large, thick fabrics (say, curtains similar in size to a hotel’s blackout curtains) but for daily use on work garments it’s okay, and for other things it’s downright perfect. Its main claim to fame here is its tank size. 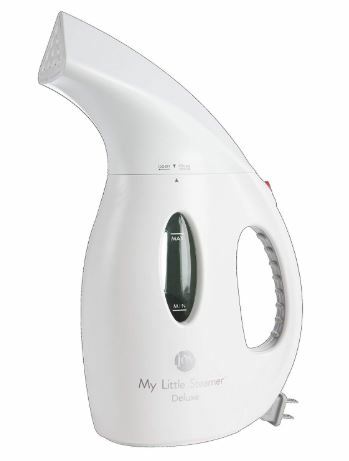 I can think of several handheld garment steamers in the same general price range that outperform the Joy Mangano My Little Steamer in one aspect or another (heat, speed, and size primarily) but all of those share the same issue: small tank size, less than half a cup in some case. 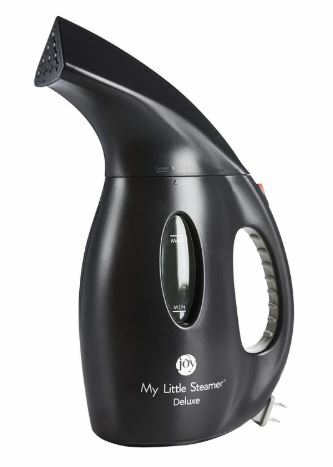 This makes Joy Mangano My Little Steamer an interesting mid-range option when it comes to garment steamers , giving it less performance and a slower speed than similar steamers on small scale jobs, but making up for it if you need to steam more than one or two garments. For daily use there are far better options, but I could see myself using Joy My Little Steamer for things like steaming the wrinkles out of garments that have been in storage for a while (say if you’re like me and store your winter clothes in a box in a storage unit 9 months out of the year) or steaming the whole family’s nicest clothes before church, a funeral, a wedding, or some other formal event. It sort of bridges the gap between a handheld and an upright steamer in that regard, and it justifies its existence (and a purchase) to me. 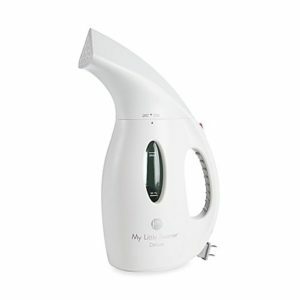 As mentioned, there are other options that perform better for certain tasks than Joy Mangano My Little Steamer. I’m going to present two that better represent the other ends of the scale that My little Steamer falls into. The Kazoo Portable Garment Steamer is a nice little travel steamer. It heats up faster than My Little Steamer, though has a smaller tank size (about a cup) and its design is much more compact, making the steam a little less directed than the design of My Little Steamer. For emergency use, this one is perfect where My little Steamer takes a bit too long to heat up. On the flipside, the PurSteam Elite Garment Steamer is a full size upright garment steamer with “dry steam”, leaving your clothes far les damp (if at all) than other steamers. If you absolutely need everything to look its best, this is the steamer for you.